This is Bill's favorite. If you ever see him out order one for Bill and he will be your friend for life. If you like Blueberries this drink will be certain to please. 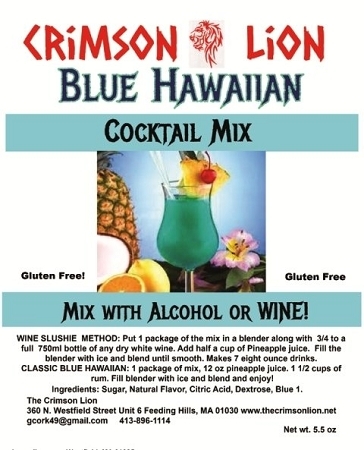 We recommend that the Blue Hawaiian drink be made with either white chardonnay wine or Vodka. There may be a particular preference to using Rum and that's o.k. too. WINE METHOD: Based on a 56 oz. blender, add 1 package of the mix, fill the blender with ice, add 3/4 to 1 bottle of White Chardonnay wine and blend. Serve and enjoy! VODKA METHOD: In a blender, add I package of the mix, add in 1-1.5 cups of Vodka, 1/2 cup of water, fill the blender with ice and blend. Serve and enjoy!